Yao is transforming from a professional player to a businessman, poised to build a new business empire. (Ecns.cn)--When Yao Ming said Wednesday in Shanghai, "Today I am announcing a personal decision: I will end my career as a professional basketball player and officially retire," speculations arose about the former NBA All-Star center's future plans off the basketball court. Some things may be implied from a seemingly off-hand joke by Xu Ji, a famous sports commentator and the MC of Yao's retirement press conference, who said "Yao Ming may be at the center of the business and financial journalists' articles in the future." Almost surely Yao is transforming from a professional player to a businessman, poised to build a new business empire. "I started investing in 2005," mentioned Yao, who has invested in various fields including catering, the Internet, real estate, hotels, and stocks. The Yao Restaurant & Bar in Houston is one of Yao's most famous projects, into which he has injected more than $1.5 million. Later, top100.cn, an online platform for authorized music that began in March 2006, announced that it had received a $3 million first-round of capital from Yao, reported the National Business Daily. In June 2010, the website reportedly got another round of investment from Yao, totaling more than $1 million. Yao did not deny at the conference that the top100.cn website merged with 1ting.com, another music website, for $10 million and is preparing to go public in the NASDAQ stock market. Besides, he is also the owner of the Sunflower Hotel in Beijing, and California Fitness Yao Ming Sports Club, with an investment of 32 million yuan ($5 million) in the latter. As a fan of science and astronomy, Yao signed in 2010 a five-year endorsement contract with Beijing UniStrong, a high-tech company specializing in Global Positioning System (GPS) technologies. According to the deal, Yao purchased 0.65% of the company's total initial offerings, which could be worth up to 80 million yuan. However, the shares can only be cashed out three years after the company was listed. Due to a plummeting stock market, the shares have been suffering low floating profits recently and are worth no more than 27 million yuan ($4.2 million). In 2009, Yao snapped up the Shanghai Sharks, the basketball team he used to play for, in which he needs to invest 30 million yuan ($4.7 million) every year for general operation and debt payments. Undoubtedly, the basketball superstar who topped Forbes' China Richest Celebrity List for seven consecutive years will continue his legend in the commercial circle. Speaking of his future business plans, Yao still wants to keep some secrets, saying at the conference "you will know them gradually in the future." 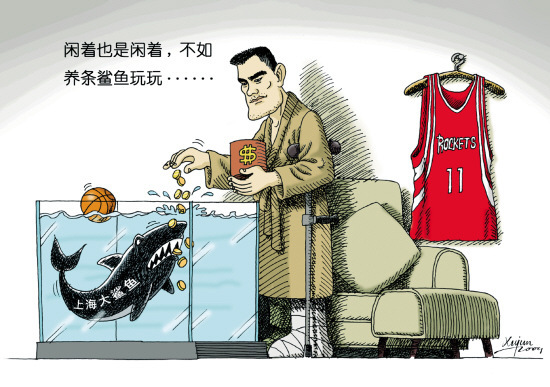 "Now Yao needs a stable capital generator," said Su Qun, a famous sports commentator, adding that the retirement will cut off Yao's high-paying salary and affect his revenue from sponsorship and advertisements. Yao had registered "Yao Ming" as a trademark in several fields in 2002 to protect his rights. However, he has not started developing his own brand yet, according to Su. "I have to get my brand back first," said Yao at the conference, declining to reveal more details. Earlier this May, he filed a lawsuit against a local sportswear producer for name and portrait infringement. Yao sued Wuhan Yunhe Dashayu Sportswear for using "Yao Ming Yi Dai," or "Yao Ming Era," without his authorization, as a brand name. Though Zhang Mingji, Yao's agent in China, pointed out that "Yao will not become the second Li Ning," the former gymnastics star who created his own clothing brand after retirement, he can still learn a lot from Li. To build a business empire, Yao needs to frame a mature business plan and find steady financial support. "Playing basketball in the NBA―the highest-paying industry, living in America―the world's best gold mine, and being supported by China―the world's largest market, it won't be hard for Yao to be a successful businessman," commented Forbes Magazine.